Teaching you about your machine is a tricky subject. There are several aspects to your machine you should really learn about: the parts of your machine (and what purpose they serve), how to thread your machine, wind a bobbin, do a basic straight stitch as well as change a needle, how to clean and oil your machine, and how to trouble shoot problems. Most of these topics are covered in your owners manual, but I understand that it can be hard to comprehend what is being explained in them. I took pictures yesterday of all of these things, thinking I could write one post about it, but then I saw that I took something like 200 pictures of the different topics and knew I had to break things up. With that out of the way, today we’ll talk parts of the machine, and next week, we’ll cover the basics of using your machine so you can get practicing, and then we’ll cover maintenance and troubleshooting the following week. I think. 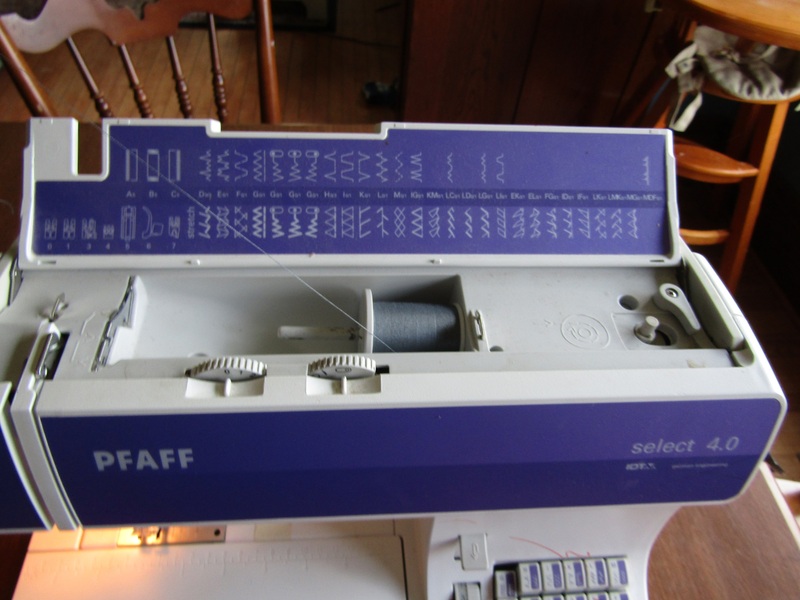 Getting to know your machine will be really important if you want to learn to love sewing. 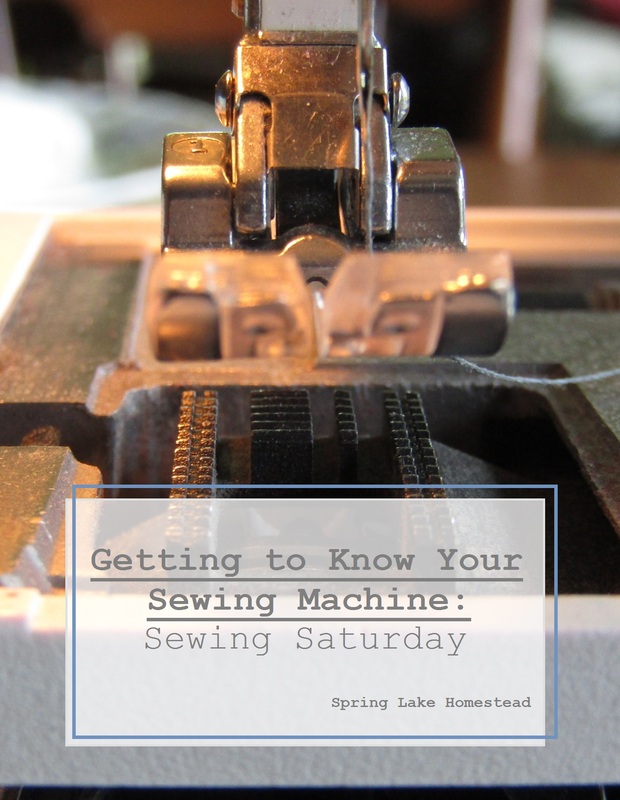 For this Sewing Saturday, we’re going to get to know the basics of your machine. I’ve met just a few too many people who hated sewing because they never really understood the parts of the machine and how it all works. It feels intimidating to people when they get started, so they don’t pay close enough attention and they struggle to ever really be successful at using their machine. First of all, I get it. I really do understand how scary a sewing machine can seem. I’ve been there. But it’s really not that complicated. It might be at first, but once you become comfortable with the machine, your motions become second nature, and you’ll surprise yourself with how quickly you can go through the motions. Your machine won’t function quite on its own. You’ll need a spool of thread, a bobbin, needles, and probably some scissors (and of course fabric). All of these things together will create a functioning machine. 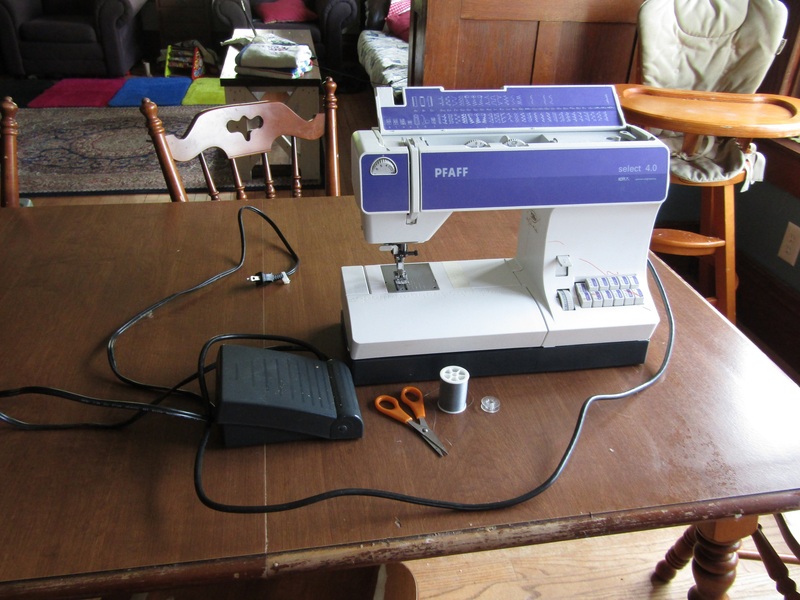 My machine (plus foot peddle/power cord), a spool of thread and a bobbin, plus scissors for cutting thread as needed. Your power cord an foot peddle are going to be connected to each other. Some machines have a removable power cord, others are permanently attached. The typical plug end will get plugged into the wall. Your foot peddle will rest on the ground, and you will want your machine to be at a comfortable height for working. Sewing machines are designed to be used sitting at a table…anything else will be awkward for you. 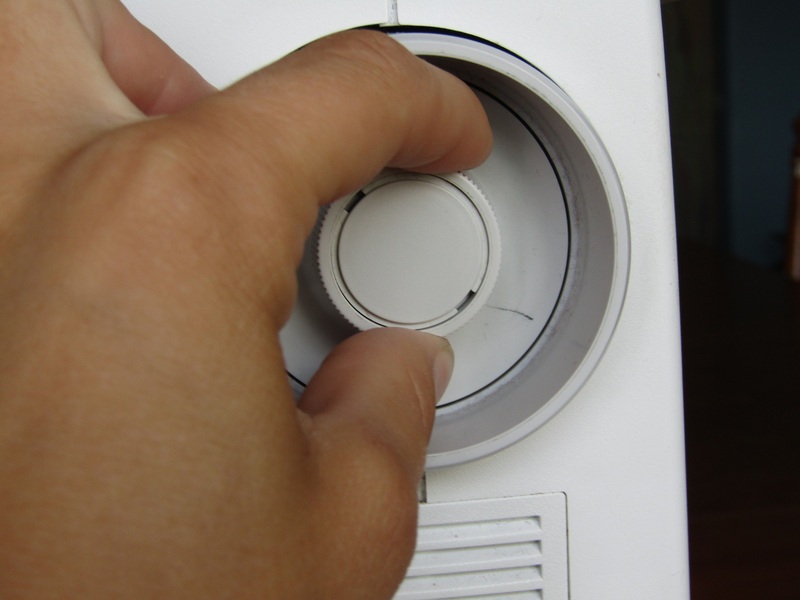 The right side of your machine (as you face it) will typically have your power button and hand wheel on it. Sometimes the power button will be in the back of the machine. Again, all machines are set up just a little bit differently, but they have the same basic parts. The wheel you see is the stitch LENGTH regulator. This determines the length of your stitch…you adjust it to make tighter or looser stitches. The lever/button is for doing a reverse stitch, and the buttons are for changing the types of stitching you can do with your machine. If you continue to look at the front of the machine and move upward, you will typically find 2-3 more dials with settings for your machine. If you just bought the machine, don’t mess with those! 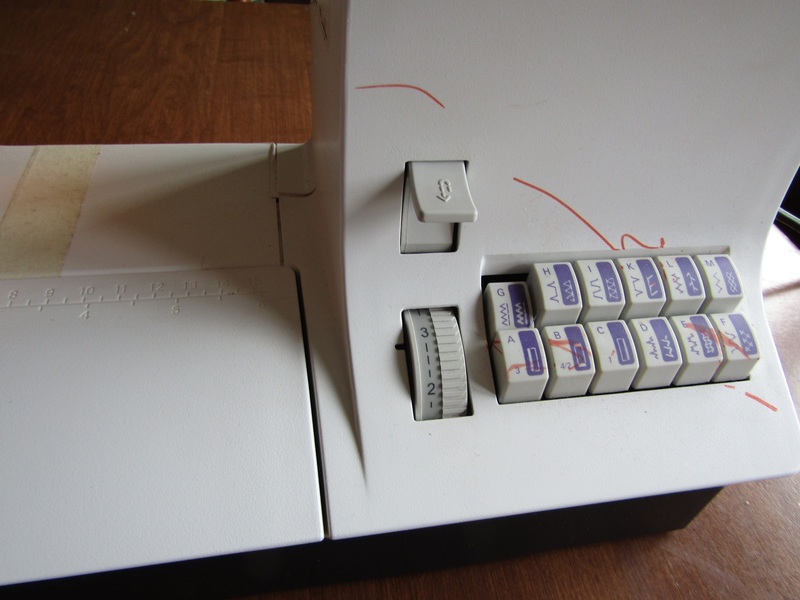 Those are the factory settings and are typically what you will need to get going with your basic sewing. 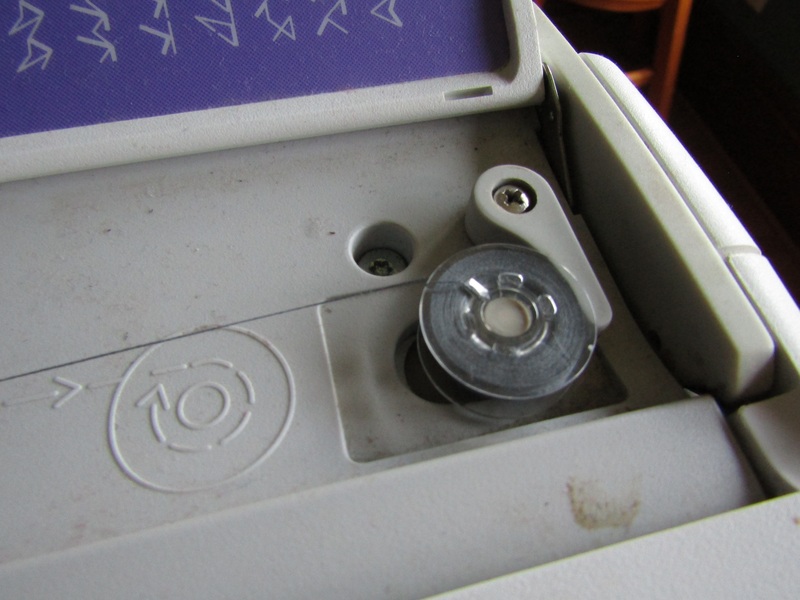 The tension knob on the top of the machine will adjust how tight your upper thread is (picture on the left below). You will almost exclusively adjust this, though there is a tension setting on the bobbin casing that might get loosened (but don’t touch it unless you have tested everything else). In the picture to the right below, the knob to the left is my stitch-width regulator…I use this to determine how wide my stitches will be if I am using a zig-zag stitch on the machine (on my machine, the number 0 is equal to a straight stitch, but a number 5 is a wide zig-zag stitch).The knob on the right is for adjusting my needle position (left to right) down below. The needle position will impact how wide your seams turn out and not all presser feet will work with different needle positions (we’ll talk more about that another time). The tension knob on the top of the machine. To the left is my stitch width regulator, and on the right is my needle position dial. That gap between the purple on the left and the purple on the right in the picture below is the thread guide area of your machine. This can be the most frustrating part of the differences in machines. They can look wildly different, but they all serve the same function: to guide your thread through the machine and needle, keeping the tension on the thread just right, and pulling the thread through the machine. I’ll try to get pictures of different thread guides and walk you through them in the machine post next week. The white section between the purple is where the thread guides are. There are tension disks inside of your machine in this area, that help keeps the thread tight enough for a good stitch. There is an arm that moves up and down that pulls your thread through the machine. Moving down below the thread guide, you have the portion of the machine where the thread reaches the needle area. If you’ll notice the thing my thumb is on in the picture below, that is an arm to raise and lower the presser foot of the machine. The presser foot is that silver/clear thing on top of the other silver thing in the picture below 🙂 It looks kind of like a foot on a leg, and it presses the fabric down (hence the name presser foot). That silver thing the presser foot is on is called the throat plate. There are little lines etched in the plate with numbers on them, and that is a seam guide. With your needle positioned correctly, your machine can show you where a proper 1/4″ or 5/8″ or other seam widths) seam should line up on the plate. Of course, there is the needle for the machine as well. These are replaceable, so if you are having trouble with a dull needle or your needle breaks, don’t worry, it’s a very common problem with a very simple fix! The metal plate is called the throat plate. Then there is the presser foot. The presser foot gets raised and lowered by a lever either on the side where my thumb is, or the same area but in the back of the machine. In this next picture, I removed the face plate for cleaning, but it gives you a clear picture of the feed dogs. The feed dogs are those black things underneath the presser foot. The presser foot will get lowered onto the throat plate and feed dogs, and the feed dogs will move forward and backward, gripping your fabric and pull it through the machine. The presser foot is there to hold your fabric in place, and if not lowered while you are sewing, your thread will bunch, knot and break. In this picture, I removed the face plate for cleaning, but you can see two black lines under the presser foot, and each line has little ridges on it…those are the feed dogs. They grip the fabric and move it through the machine. They “feed” your fabric through the machine. Underneath the feed dogs and face plate, there is an area of the machine called the bobbin housing. It houses the bobbin and bobbin casing. The bobbin holds thread for the bottom of the machine to give you that nice stitch you are so familiar with (even if you didn’t know you were). The casing is the metal thing in my hand below… this does need to be threaded properly, or you will have problems with your work. With the bobbin inside of the casing, it gets inserted into the bobbin housing. Now if you go up to the top of your machine, this is where the magic happens. Not all machines have a bobbin winder, or at least not a bobbin winder that works. Don’t worry if that’s you; you can always purchase a bobbin winder (it’s a separate machine), or you have the option to wind your bobbin by hand, though I wouldn’t exactly recommend that! Continuing to look at the top of the machine, you also have the spool pin and cap. Sometimes a machine will no longer have the cap. It’s not a huge deal if you don’t have one, especially if your pin is an upright one, but mine is not, and that cap is especially helpful. In order to make that bobbin winder work, you will need to turn on your machine’s bobbin winding capabilities. On almost every machine, there will be a little knob or button inside of the hand wheel. If you turn that little knob, it should turn your bobbin winding on and off. Your machine needle will probably not go up and down while it is winding, and your bobbin should be spinning once you step on your foot peddle and have everything positioned properly for bobbin winding (I’ll cover that all next week). Inside my turn wheel is another knob that I turn to turn my bobbin winding function on and off. To turn mine on, I have to twist it a quarter turn. Some function a bit differently but are generally the same. My machine has a few additional features that some machines may or may not have. The first is a little thread cutter on the left side of the machine near the needle. It’s a little metal hook that I can slide my thread into, pull, and cut. I do use this feature often, but it’s definitely not something you need in a machine. The next feature I have is a needle threader. I never use it. They are very delicate, and it doesn’t take much for them to have a part get damaged and never have it work again. It is kind of a nice feature if your eyes aren’t the greatest, but I’d just recommend making sure that you have a sharp scissors for cutting your thread, that you use that spit trick I talked about last week for cleaning and straightening up the end of your thread, or, if your vision is that bad, you can get special magnifying glasses for sewing or for your finger that will help you see your needle eye and thread better. My machine also has a needle threader that I never use. They are extremely delicate and will easily “break” so that they do not work. While it might be a handy feature for some, I wouldn’t recommend relying on it. The final feature that my machine has that many of yours will have as well, is a removable case that will allow you the ability to use your machine’s “free arm” feature. 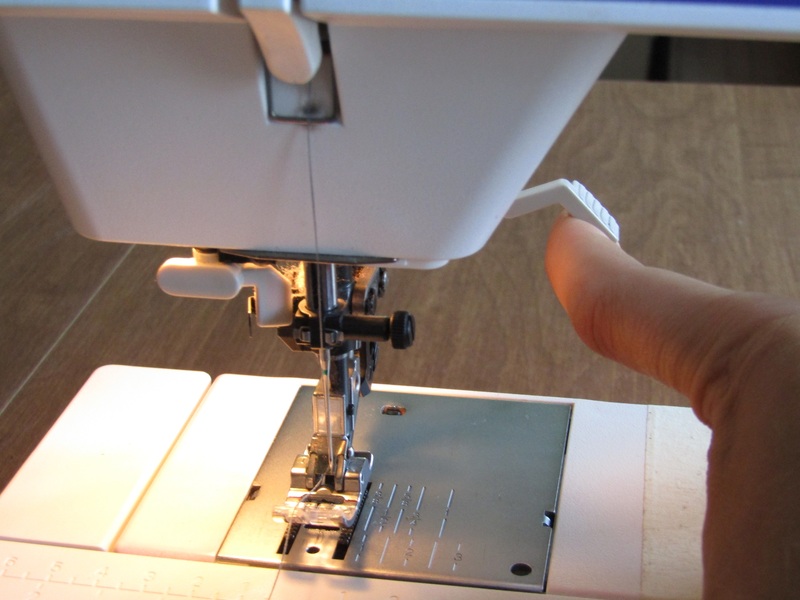 The case creates a nice flat table for your sewing work but if you are trying to sew in a tight area, like hemming the leg of a pair of pants, you will have a much easier time if you can slip that leg onto the machine’s arm. These cases open up and have a storage space for things like extra bobbins, specialized machine feet, a small screw driver, a dusting brush, and a seam ripper. My machine has the free arm option, and you will notice it becomes accessible when you want to reach your bobbin housing. Mine has a pivot point and can be pulled out of the pivot, others often slide or clip in and out. Some machines won’t have this feature at all. The piece comes fully out, leaving the arm of my machine free. This will allow me to sew things like pant hems easily. and a storage area for things like a seam ripper, machine oil, or a brush for cleaning lint out of your machine. 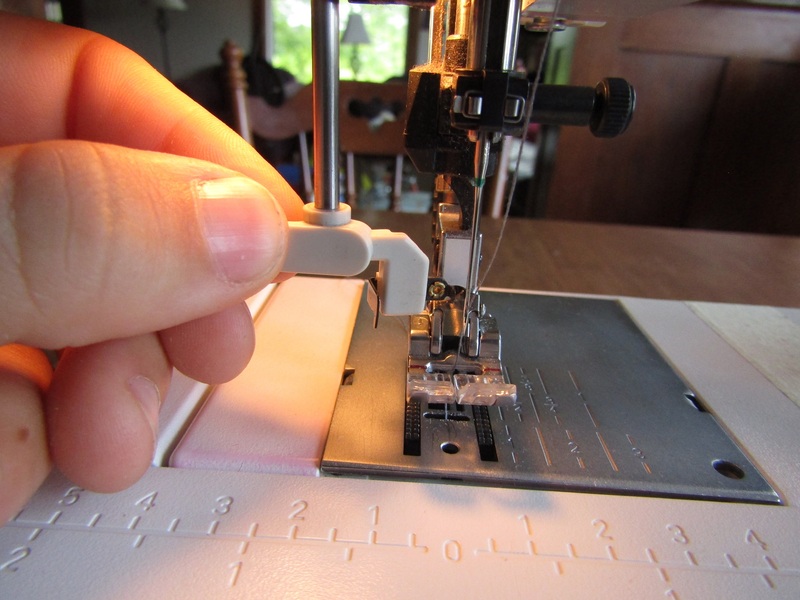 If you would like to test yourself a little more on the parts of a sewing machine, here are a few links to sites that can give you some more practice and information. If you missed the other posts in our series, you can check them out here, here, here and here. I had intended to get up a second post for today but I didn’t get as much free time as I had anticipated this week for writing. 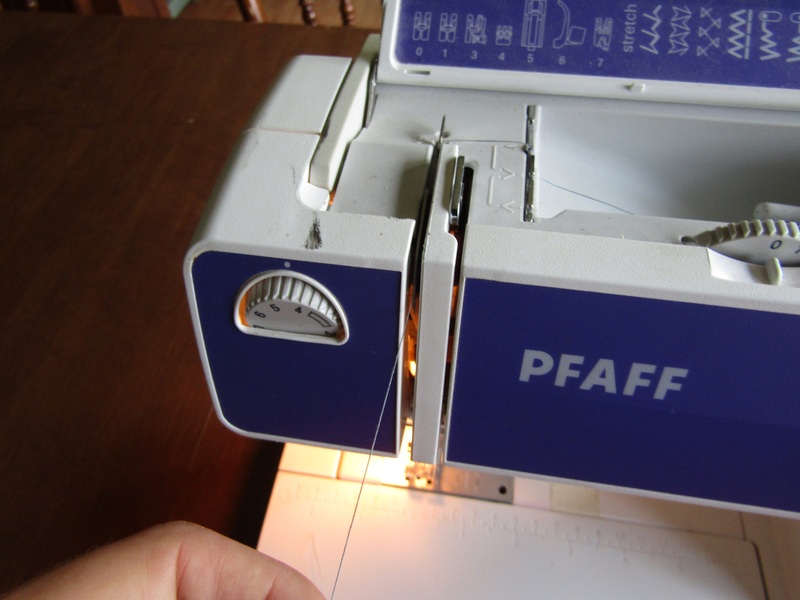 Next week, we’ll go over several new hand sewing stitches, and I’ll get that other machine sewing post up for you! Let me know if you have any questions or comments! Like I said, we’ll be sharing more next week. Sorry it can’t be more at once, but I don’t want to overwhelm you! Thanks for taking things one step at a time. Can’t wait to continue. I dont use the needle threader either. Also, it seems every time I have to wind a bobbin, I have to do some trial and error for it to work. The machine works fine, but something about getting it started confuses me. For that reason, I am considering purchasing the bobbin winder. Good information here. I didnt sew for years just because I couldnt thread the machine or change the needle! 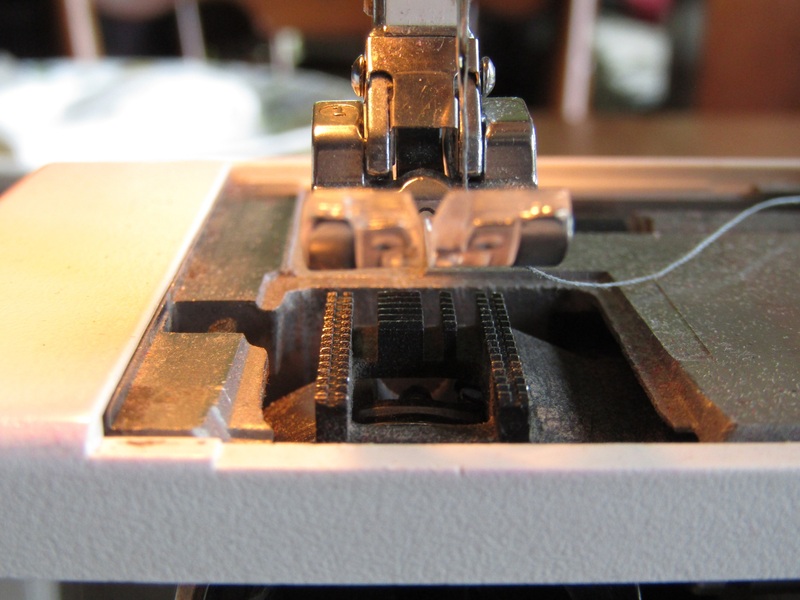 And I think that’s exactly why so many people don’t sew… getting comfortable with those parts of your machine are the biggest hurdle! I’ll go over the bobbin winding in the next post, so you may want to hold out before purchasing one, but that’s up to you. I used to struggle with bobbin winding back when I was first learning to really operate the machine without my mom’s help. 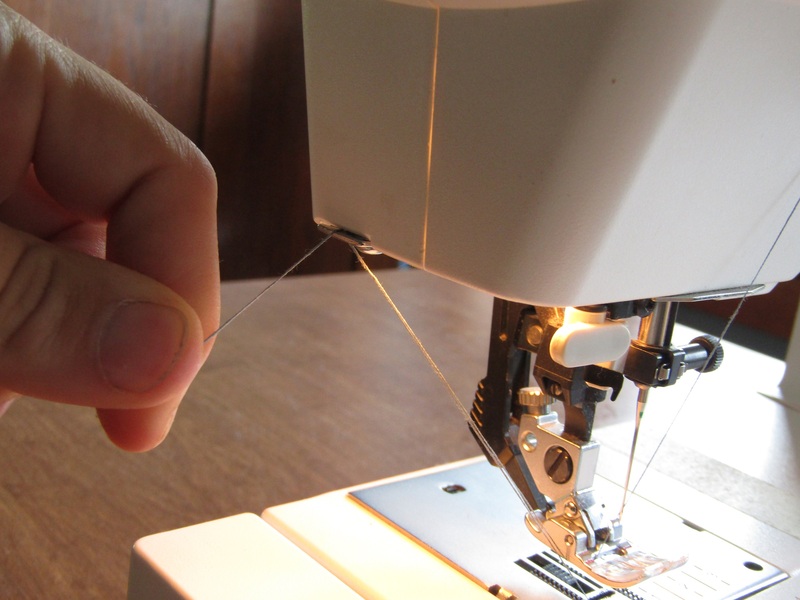 Nice, informative article for sewing whether a beginner or veteran at it. I have a SideWinder! I truly love it, it makes bobbin-winding so simple and I don’t have to rethread my machine.